Part of the Dounreay nuclear site in Caithness has been shut down after a radioactive spill. A treatment plant was closed after an alert involving a batch of hazardous, dissolved spent fuel. Officials said nobody had been harmed, or exposed to radioactive waste, as a result of the problem in the cementation area. It happened during decommissioning work at the complex, which is run by the United Kingdom Atomic Energy Authority. The liquid, which is kept in underground tanks, is pumped to the area, where it is mixed with cement then stored in 500-litre drums. The work is done by robot but early on Monday morning, 266 litres of radioactive material and 300 kgs of cement were spilled. The material has solidified onto the floor of a treatment cell. The authority said the spill was "contained within the cell", but admitted it was a "setback" to the 30-year decommissioning programme. The unit at the centre of the alert plays a key role in the operation to clear Dounreay of radioactive material. 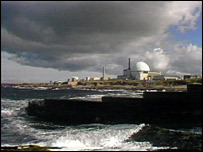 A Dounreay spokesman said: "An alarm was activated and the operators became aware of a problem. "The plant has been shut down and our people are investigating what action we can take. "All the radiation is contained within the cell and there was no danger to any individual as the walls are about 4ft thick and work is done robotically." A Health and Safety Executive spokesman said: "On the basis of what we know, there are no immediate safety implications either for the workers, the public or the environment. "Our Nuclear Installations Inspectorate (NII) will go to the site next week." The Scottish Environment Protection Agency (Sepa) and the Nuclear Decommissioning Authority (NDA) have also been alerted. The latest problem came only days after managers were served with an enforcement order, after breaking rules which allowed the disposal of radioactive waste.